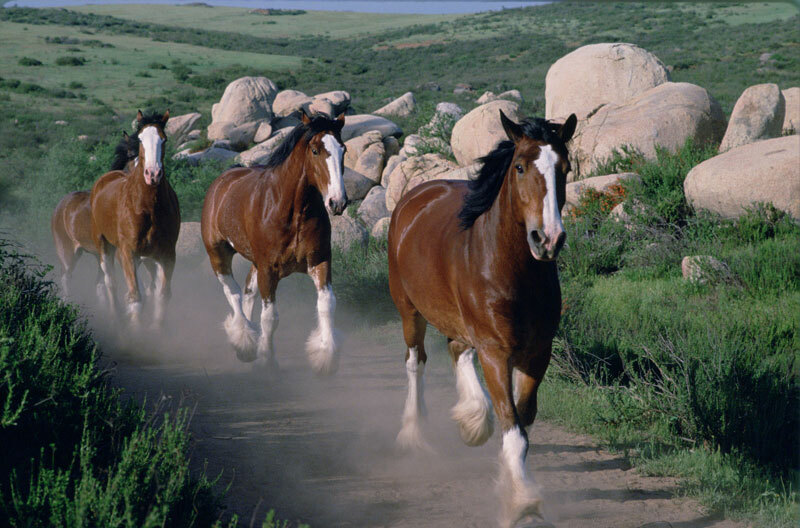 Home Horse Breeds Features Are You Ready for Some Clydesdales? It’s almost time for the Super Bowl, the biggest event in football that draws two types of spectators: those who actually enjoy watching the game, and those who watch just for the commercials (or, nowadays, those who DVR the game and then fast-forward through it to get to the commercials). For us horse lovers, whether we enjoy the game or not, we all get excited for the annual Anheuser-Busch ad featuring the Budweiser Clydesdales. The real Budweiser hitches are used in the Super Bowl ads. You won’t see any equine actors playing the parts of the Budweiser Clydesdales. Only the real deal will do. “[If they need the hitch], we use the actual hitch that is out performing day in and day out in front of the public,” says Doug Bousselot, lead driver for the West Coast Budweiser hitch based in Fort Collins, Colo. “If it’s going to be a specific trick, like bumping the tree for the snowball fight commercial or rolling snowballs, we use spare horses that are not on the hitch. Then we use younger ones for the foals. The skills the horses need to know vary from year to year depending on what the plot of the commercial is. “Some of the foals they taught to paw at a volleyball, and that’s how we taught them to do the snowball fight; [the ball is] what they learned to roll with their nose,” says Bousselot. Many of the commercials are filmed in three days. Care is taken to make sure all of the horses get plenty of rest in between their scenes. 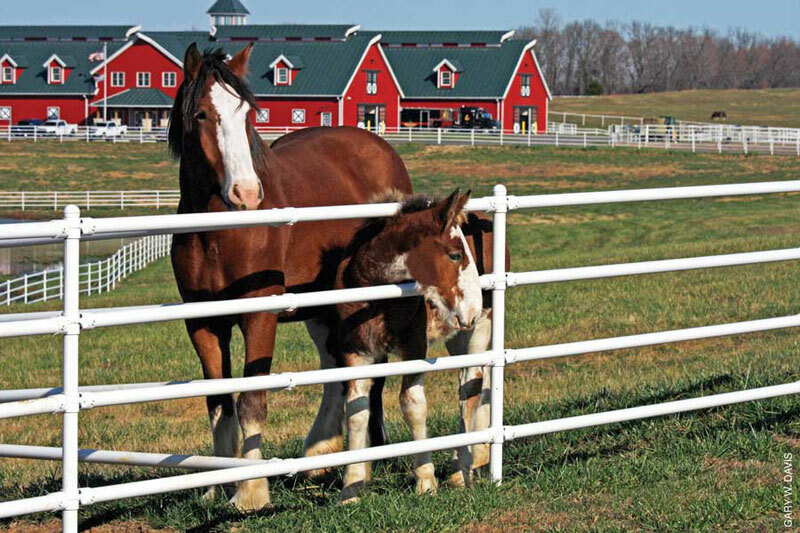 About 30 to 40 Clydesdale foals are born at Warm Spring Ranch each year. 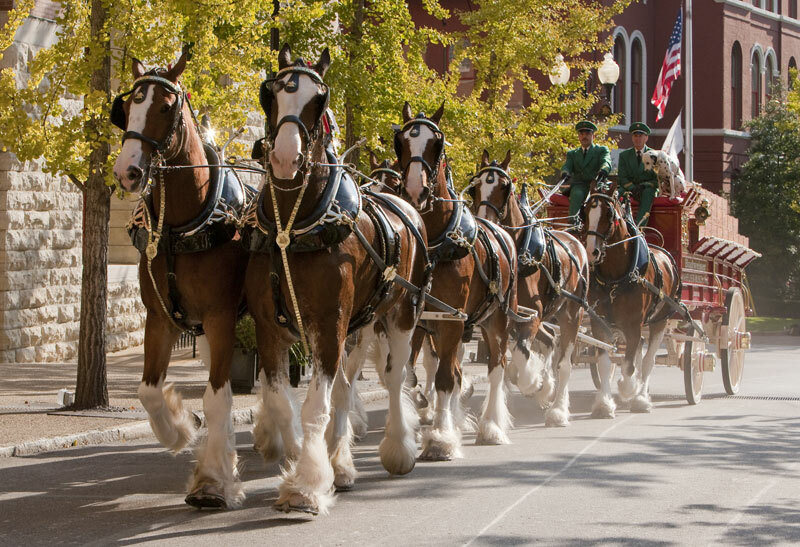 In addition to the Super Bowl commercials, the Budweiser Clydesdales represent Anheuser-Busch throughout the year at fairs, rodeos, sporting events, parades and more. At the Merrimack, N.H., farm, the Clydesdales (all around the age of 3) begin their hitch training, starting in pairs and gradually working up to the eight-horse hitch. “Once we get them out on the road, we pair them up with an older horse and let them ease into the job,” says Bousselot, who adds that horses don’t go out on the road until they’re at least 4 years old. In addition to hitch work, training focuses on teaching the horses to stand still until they’re asked to move, and introducing them to loud noises, traffic and people. Learning to work together is important too. Out on the road, the hitches do a lot of parade-type work. If they’re attending an event in an equestrian arena, though, they can show off some pretty slick moves. “We’ll do a figure-eight pattern to show how the horses can move with the wagon, and we’ll do what we call our docking procedure,” says Bousselot. “We’ll show how the horses can sidepass 180 degrees and then put the wagon 90 degrees to the wall like they were docking in the old days. Then we’ll swing them all the way back without the wagon moving, like if they had to clear [the way] for more horses coming in with another wagon. Despite their imposing size, Bousselot says the Clydesdales are very gentle and eager to please. To keep the Clydesdales happy and healthy while they’re on the road, shooting a commercial or greeting the public at home, each horse is fed a diet perfectly tuned to his individual needs. Purina works closely with the teams in charge of the horses to ensure that all of the Clydesdales’ nutrition requirements are being met. Most of the Clydesdales are easy keepers and eat 2 to 3 pounds of ration balancer a day in addition to their hay. Some harder keepers eat up to 14 pounds of grain a day. Like any sound equine diet, the Clydesdales’ meal plans start with good-quality forage. Remaining calorie and nutrient needs are met with a Purina feed. Purina supplies all three Budweiser hitches and Grant’s Farm, where the young horses and some of the retired Clydesdales reside. This article originally appeared in the February 2014 issue of Horse Illustrated. Click here to subscribe. My Dream Horse has been a Clydesdale. Thank you Budweiser and Anheuser-Busch for bring this joy to the whole world. The Clydesdales come to my county’s fair almost every year and they never seize to amaze me! I’ve viewed one of the commercials and it almost made me cry! Their commercials are fantastic and to think the horse’s do their own work is amazing. We visited the clydesdales in Ft Collins, Colorado. My daughter got her picture taken with one named Prince. He weighed 2,200 pounds. The ones that didn’t match the hitch are sold for big bucks to people who want to own a Budweiser Clydesdale. These big guys are just awesome, the best part of watching the Super Bowl is seeing these commercials. Thanks to all for such great intertainment. Keep on with it please. It’s hard not to look at these horses without think “AWESOME”, simply awesome!! Neat article! I watched all the commercials online, because they weren’t being shown on TV! Good pictures, Love the clydesdales!